How do we clean water in the swimming pool? Swimming pool operation is fully automatic. Chlorine dosage is controlled by a computer. The quality is checked 24/7. Values are recorded and checked. Water must abide to ČSN norm for swimming of infants and toddlers. Water-station takes samples regularly and they are analysed in the Regional Hygiene Station (KHS). Water is also cleaned by UV rays which reliably kills bacteria in water. Water analysis can be seen in our office. Why do children in the swimming course without parents have free warming-up swimming lasting 10 – 15 minutes? Warming-up swimming is included in the lesson intentionally and it’s a part of the methodology. After sitting for the whole day in school and afterschool activities, children have higher need for running around, shouting and playing. Without warming-up swimming, they lack concentration and teaching stagnates. Is swimming in winter suitable for children? Yes. The best time for children immunity training is winter. You don’t need to be afraid of falling ill after swimming. 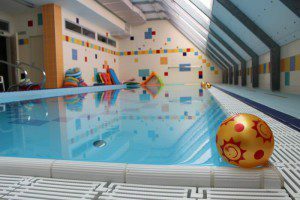 Children can spend time in the playroom in our club to acclimatize. Why is the swimming pool available also for adults? Adults are swimming in evening hours. Swimming pool is cleaned and filtered several times during the night. In the morning it complies to very strict hygiene norms for infant and toddler swimming. This approach is approved by KHS. Adult swimming is limited to one hour three times a week. Why do we have to shower without swimsuit? There are many bacteria that are useful for bodies but harmful in water. We require showering without swimsuit and washing with soap because it’s the only way to prevent spreading bacterial infections. Why do I have to wear swimming cup and goggles? Swimming cup prevents hair from falling into water. Hair can be swallowed by infants and cause vomiting. Swimming caps on heads of children and adults are a big help, because they don’t have to care about hairstyle and hair in their eyes, which can cause accidental submersion of an infant. Children can better focus on swimming, movement and orientation under water. Is it possible to buy swimming accessories at Fontána? Yes. We have swimming caps, goggles, boards, bands. Temperature in the swimming pool is 32°C by standard. This temperature is measured and controlled all the time. What is the required level of swimming proficiency? There’s no required level of swimming proficiency for the courses. Even though your child cannot swim at all, you can apply for any course you wish.